Inside: How to make a no-sew bow tie. 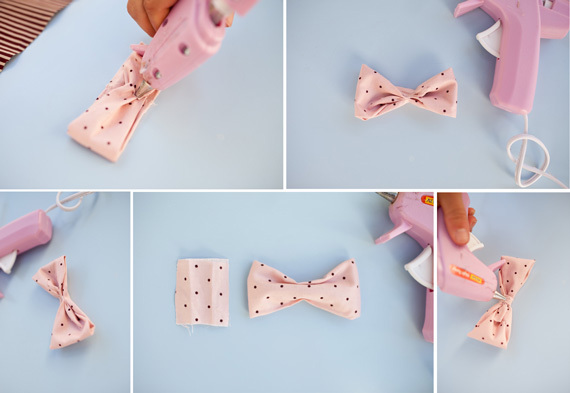 These fabric bows no sew make perfect cake toppers! 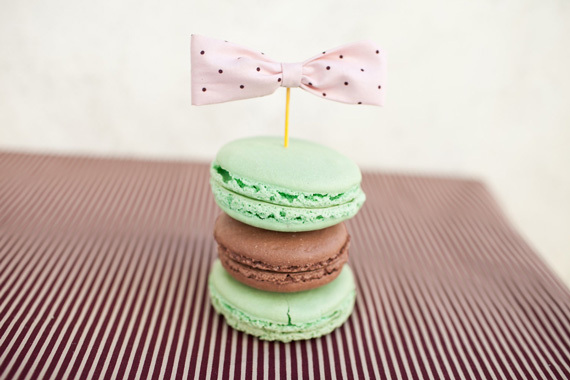 A no sew bow tie is the perfect tiny toppers for any sort of sweet. But if you’re like me you might not be the best with a sewing machine. That’s why this no-sew bow tie project is perfect! 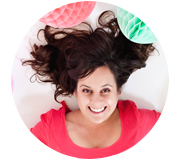 I designed this DIY bow tie to share at Style Me Pretty yesterday. It turned out to be one of the easiest projects ever. Not even one ounce of sewing involved! So, let me help you out with how to make a bow out of fabric without sewing! Now that you know how to make a no-sew bow tie, the possibilities are endless! Here are a few of my favorite DIY bow projects! Bows and Cakes, I mean is there a better combo? Not a cake fan? How about Pies and Bows? Now I got ya! These paper bow invitations are one of my all time favorites! How about these bright and bold bow stocking! 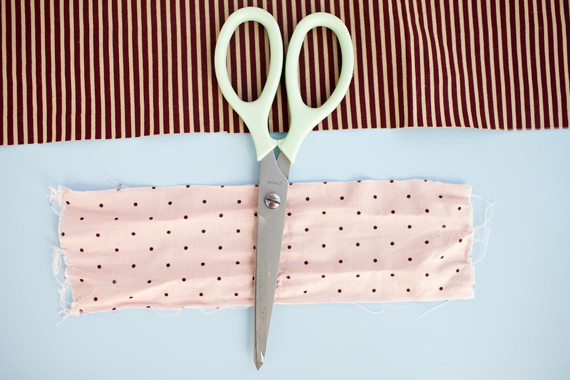 Cut your fabric of choice to size. For each bow tie cut one 6 inches by 3-inch piece plus another 1 inch by 1-inch piece. You don’t need to worry about the rough fabric edges, they will all be turned under. Turn your fabric so the backside is facing you and fold up the bottom long end and fold down the top long end to meet in the middle. Fold each short end into the halfway point, joining them together in the middle and leaving you with the back of a basic no sew bow tie. Hot glue this portion down and together with one small dab in the middle backside of the fabric. Using your fingers scrunch down the backside of the bow tie creating small pleats. Use a few dabs of glue to secure these pleats and hold into place until the glue dries (about 30 seconds). Take your small piece of fabric and fold it into thirds. Wrap it around the middle of your bow tie and secure on the backside with glue. This little piece should effectively hide all your previous glue dots and will complete the front of your tie nicely. 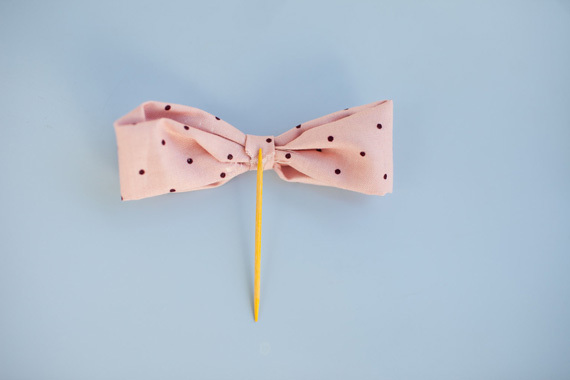 Using one more dot of glue, attach your no sew bow tie to a toothpick or small dowel to the back side of your fabric bows with no sew! 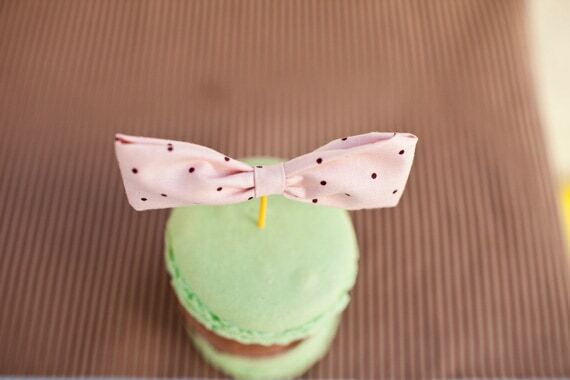 One of my favorite things to do with these easy no-sew bow ties is to add them on top of cupcakes or cakes! They add that special little flair to all your yummy treats! 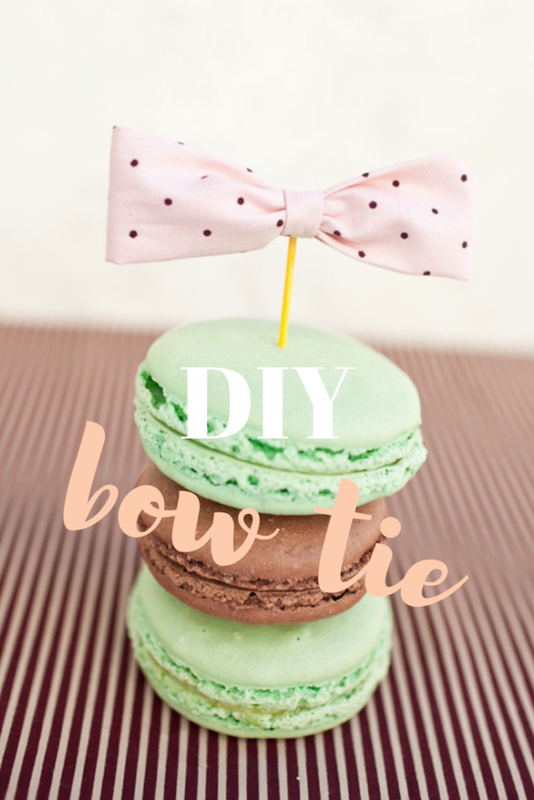 Now, depending on the size of your dessert you can change the size of the no-sew bow ties to fit them perfectly! I also love the idea of using these cute little toppers instead of candles, especially with little hands trying to grab a little quick taste of icing! Stick into your dessert and enjoy. These no sew bow ties are perfect for all different projects from hair clips, garlands to pretty cupcake toppers! Special thanks to the Lisko Artisan Deli and Fish Market for the scrumptious macaroons. PS. These would also look festive in a deep blue pinstripe for dad’s special breakfast. Love the idea. Sure they look great also on cupcakes. I absolutely adore these! Hope the move is going well! I love bowties! This is adorable. I am definitely going to use! 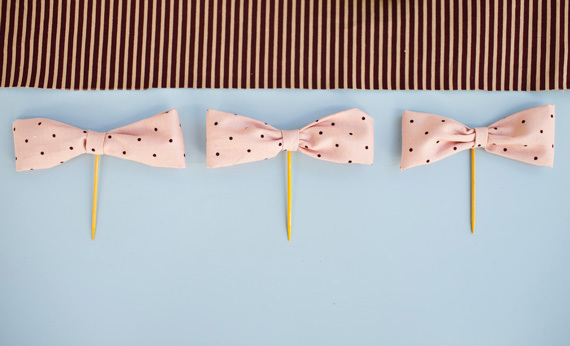 Oh, hello super cute bowties. You are my new favourite thing. OH! these are sooo cute! Victoria, these are absolutely adorable! I LOVE the simplicity and unique idea!! i bookmarked this as soon as i saw it on SMP. it’s so great!!! & super easy to do… it’s a must-try!